calculacha! 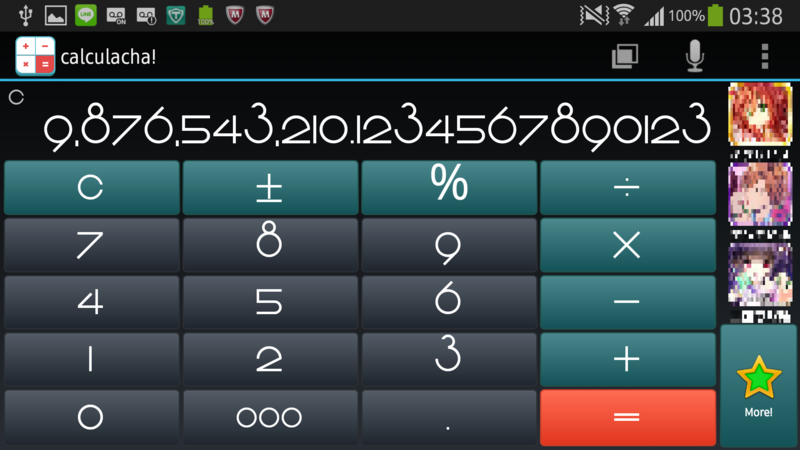 is an amazing calculator app from the creator of tweecha that lets you easily work out percentages! 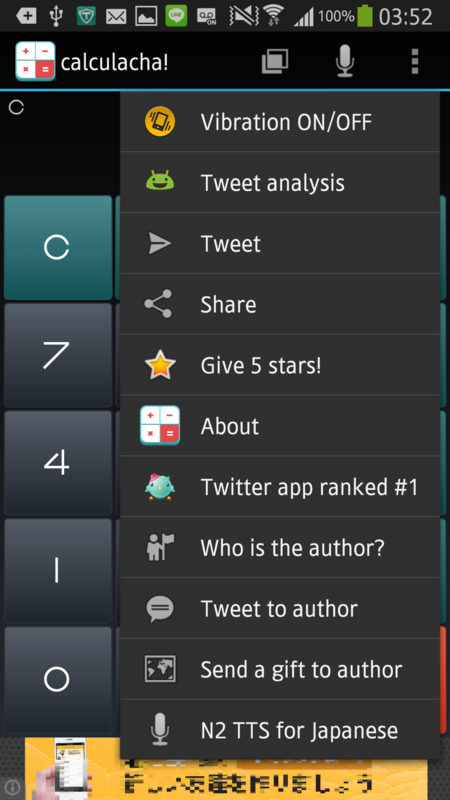 tweecha has been awarded #1 in Twitter app ranking. You can easily calculate percentages! You can calculate percentages easily! Incredibly handy! Below are examples. Yes it’s true! This calculator can talk! It reads out loud the key you’ve pressed or a search result you’ve tapped! *To enable text-to-speech you need a Japanese text-to-speech software such as N2 TTS. Go to ‘Engine’, tick KDDILABS N2 TTS to enable. Set default engine to KDDILABS N2 TTS. Tap ‘Play Sample’ and check you can hear a Japanese voice. Touch keys to check for sound. I pressed the wrong key! Wrong digit! I want to do it again! Press clear button to cancel the last digit. Press and hold to clear all! ‘C’ button is the equivalent to ‘backspace’ key on a computer and deletes the last digit. Press hold to initialize value or calculation. How many digits?! Input up to 24 digits, display up to 48 digits! What would be a useful feature? Decimal calculation by typing in a denominator of a fraction. For 1/2, key in 2/=, 1/3 is 3/=, 1/125 is 125/= and you get your decimals. Type 1 million quickly! There is a ‘000’ button that lets you key in thousands. You don’t see it much but this ‘000’ button is useful! What was the last button I pressed? 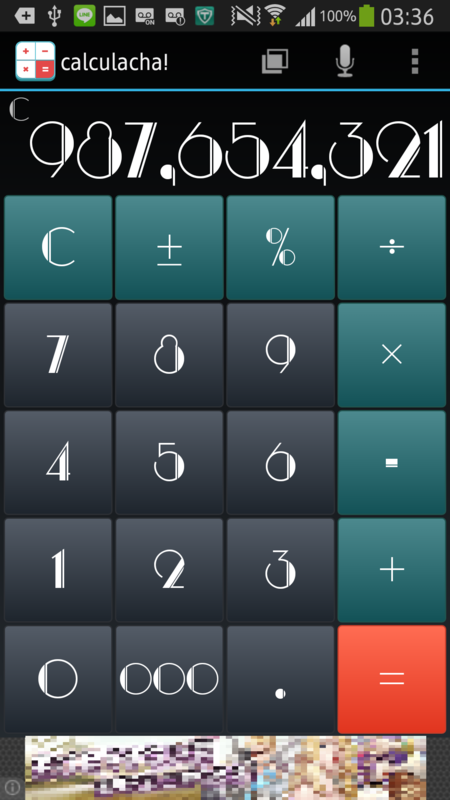 Displays last calculation on the top left side of the screen. 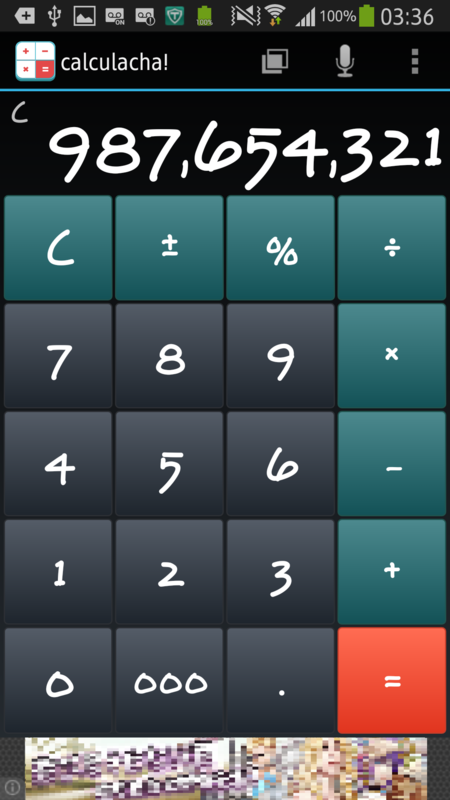 Displays status such as your calculation (*,/,+,-) and error (E), reset (C), calculation result (=). I use plus-minus change button a lot. Displays 48 digits?! Changes font size automatically. You see it a lot these days. I have built it in, too. 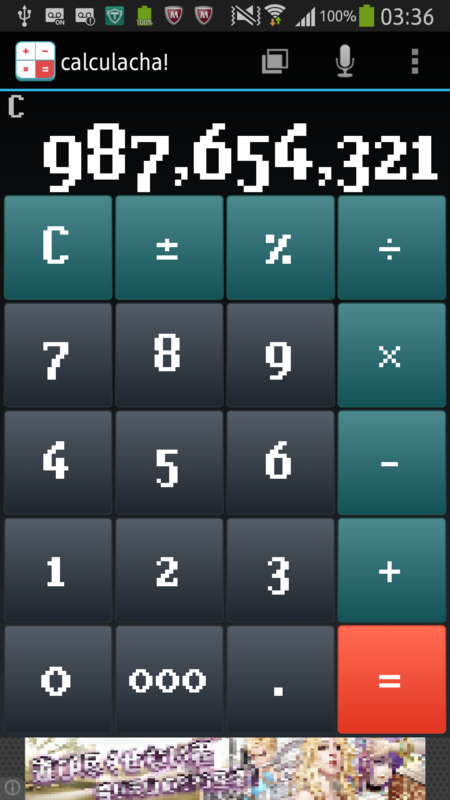 I know the one where you can do the last calculation again by pressing = button! This function is available on most cauculators. After you pressed 1+5=, press = again and it adds 5 again. Hold on, are there more hidden functions?! Indeed, there are! You can change fonts! You can have Pi-chan on your screen! Find them! You can also tweet. Find it in the menu! Added to menu: Give 5 stars! Reads out loud comments saved on clipboard. Restored font setting at start-up. Restored text-to-speech setting at start-up. Restored Pi-chan display setting at start-up. In case of no text-to-speech, N2TTS play store is displayed. Added to menu: who is the author? Added to menu: send a gift to author. Prepared this introductory page for v0.5.0 release. Minor adjustment to layout and color.